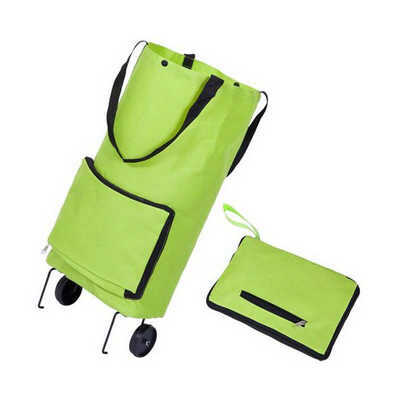 2 in 1 Collapsible Shopping Trolley Bag, is an ideal shopping tool for your daily life, and can hold a great deal of Its. It can be folded and packed away. You can choose to carry this shopping bag over your shoulder, or expand it to full size and pull it behind on the wheeled base. They can be branded with your company name or logo. Material - 600D oxford Colours - Black, Rose Pink, White, Wine Red, Red, Blue, Orange, Light Blue, Green, Grey, Brown, Yellow, Purple, Cyan Product size - Unfolded size: 58 x 28 x 14.5 cm Folded Size: 19 x 28 cm/ Without Gusset Print size - Unfolded & Folded:15 x 10cm. Price includes : 2wk 1 col/pos print. Setup is included.